A Woman of Many Talents – Ivy Supersonic – Drops by the GingerNewYork TV Show to Share Stories of Her Life as an Artist & Producer. RSVP for Studio Audience. Manhattan Neighborhood Network, Friday Nov 24, 2017, Spectrum 34 & 1995, 2pm. NEW YORK – Nov. 13, 2017 – PRLog — Ivy Supersonic: is a force of nature. She is a woman on a mission: to inspire the people of the world into realizing their own potential for freedom and happiness. Literally the woman of many hats, the magical hatter, her multidimensional personality gives her the unique ability and insight to spread her positive message around the world via her “It’s All Good” Campaign, her magical feathered hats, her electrifying runway affairs featuring living works of art, her SQRAT cartoon character, and by whatever other means she can. Her creative energies are explosive and visionary. A multi-talented designer of fashion, art, music, entertainment and marketing, Ivy Supersonic is a catalyst for the creative, motivated and talented. She is also a high-voltage events producer of the fun and outrageous. Her friends and associates extend from grass roots to the very top of the entertainment industry food chain. She is a style guru and publicity powerhouse. This past year alone, she has thrown parties for Gene Simmons, Crosby, Stills & Nash, and Wyclef. 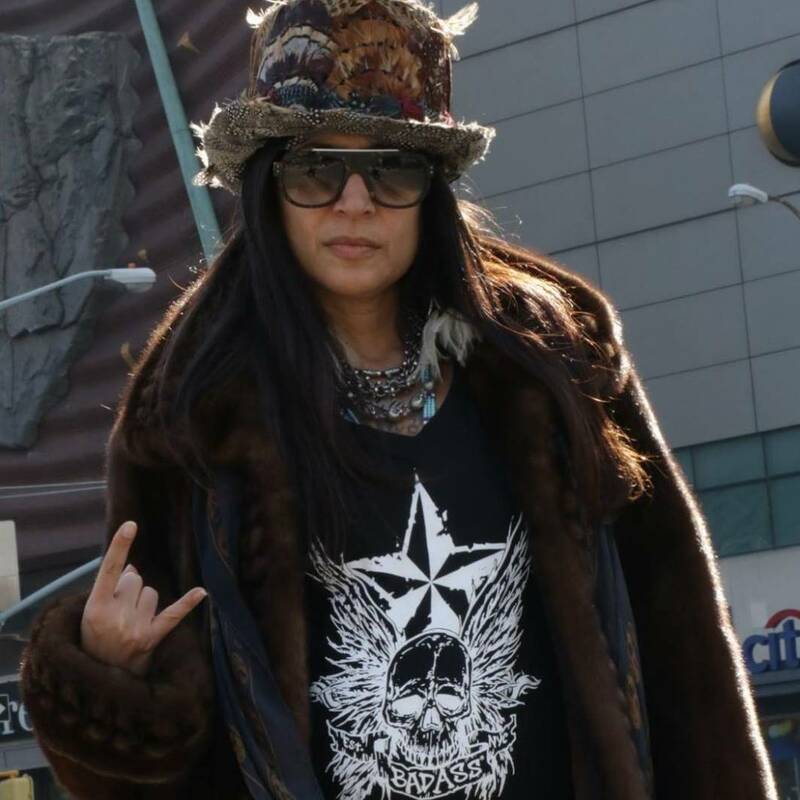 As a couture hat designer to the stars, she has designed hats for Pamela Anderson, Snoop Dogg, Hillary Rodham Clinton, Monica Lewinski, Scott Weiland, Carmen Electra, and many, many others. Ivy’s feathered hat designs are as glamorous as they are eclectic. Her global media coverage includes features on VH-1, Wild On E!, Fashion Television, CNN, and numerous other networks and shows. Ivy truly specializes in pushing limits that provide the ultimate in organized chaos. Her fashion extravaganzas turn into media-frenzied wfv events. Having graduated from the Fashion Institute of Technology, Ivy’s career began during her college years, when she launched her denim collection I.B.I.V. The jeans, whose sheer audacity impressed then-Vogue fashion editor Elizabeth Salzman, have been described as modish and edgy, embodying the energy of the sixties. Within three months of their launch, the jeans were featured on the cover of Women’s Wear Daily. Once she and her designs had achieved instant notoriety, designers scrambled to embrace her new trend. After her designs had made their way into the mainstream, they were featured on MTV, Beverly Hills, 90210 and Good Morning America. Ivy Supersonic’s creative philosophy has and will continue to be new, fresh and infinitely applicable. Quite simply, she pushes creative boundaries. Down for whatever, whenever, Ivy is a woman with purpose on a quest for the new, the fresh and the inspired. GingerNewYork found on Manhattan Neighborhood Network (MNN) since launching in November, 2010, has been showcasing the “Kool Kats…Gotham Nights” greats of music and culture of New York and beyond. What defines GingerNewYork is its host Ginger Broderick’s unique insight, connection to and pulse on the music and culture of Gotham making GingerNewYork one of the most sought after programs to appear on. GingerNewYork can be seen in Manhattan on Time Warner Cable Channel 34 and HD Channel 1995, Fios Channel 33, and RCN Channel 82, every Friday afternoon at 2pm EST. It can also be seen live streaming on the Manhattan Neighborhood Network’s website, www.mnn.org, Channels 1 and 5. Ms. Broderick completed her TV Producer’s Certification at Manhattan Neighborhood Network and launched her own talk/variety show, GingerNewYork. Segments of the show are aired LIVE at the MNN studios and taped at the Gibson Guitar showroom/Rehearsal Studios in New York City. Next articleAcclaimed Chicago Family Law Attorney Arthur Kallow Keynotes Legal Seminar Series — Law Offices of Jeffery M. Leving Ltd.